When Mike and I first moved here, we took an impromptu road trip, and stopped off in Valparaiso for literally 5 minutes. It was a miserable, cloudy day, and we mostly saw the ugly port littered with freight ships. That was two months ago, and since then, every Chilean and tourist goes out of their way to tell us to give "Valpo" another chance. Scroll down below if you want to see a video of my Valpo experience! I intentionally chose a sunny day to visit, smack in the middle of the week to avoid crowds. The bus system in Chile is incredibly efficient, and there are buses out to Valpo every 10 minutes. Couldn't get easier. While there are numerous options, I always go to “Pajaritos” metro station and use the terminal there. 90 minutes later, I was strolling through the streets of Valpo with camera in hand, and a few landmarks to guide my trip. As I walked on Ave. Pedro Montt, I was still very confused as to why people were obsessed with this port city. It was filled with street vendors selling useless crap, endless rows of sopaipilla stands, accompanied by a few unsavory characters. Bleh. Here's what you need to know about Valparaiso - it's made up of 40-something hills, and hidden in those windy cerros are the gems of this city. It's amazing to see Valpo change the higher up you go - more colorful, prettier restaurants, and better views. I wasn't really sure where I was going, but I knew I needed to check off a couple of must-see graffiti sightings so I let Google Maps guide me as I made my way up. By 3pm, the sun's rays reflected off the colorful homes and showed off the city in a different (ie better) way. I was so happy! I never put my camera down for a second; at every turn, there was something to capture, a mural to stare at and pretend I understood its meaning. The two famous ones are the "Piano Stairs' and "Happies, not Hippies", but oddly enough, they were the most underwhelming. We are not hippies, we are happies. Not my favorite. I checked them off the list, and kept walking to meet my tour guide! As I've mentioned before, Santiago and its surrounding cities have many free walking tours. A lot of blogs recommended the Grafreeti street art tour, so at 3:30pm, I met my tour guide in the plaza. Luckily, I was the only one so I got a private tour! Eddy is a Chilean native who grew up in Brooklyn, and he's been a graffiti artist for 13(!) years. He knew anything and everything there is to know about Valparaiso's art scene. Anytime I pointed to a mural, he knew the artist, and the meaning behind it. He was also well-versed in Chilean history, philosophy and could have probably talked to me about tagging and graffiti for days. He's the one who introduced me to my favorite street art murals, which I've shown below. This is done by the self-described Mapuche (mah-poo-chay) artist Piuke (Mapuche are one of the indigenous groups in Chile). As part of a young man's initiation into manhood, he had to climb one of the tallest mountains in the world, wait to spot a condor's nest and grab its feather. This rite of passage is beautifully depicted in the mural below, you have to see it for yourself to appreciate its beauty. Admittedly, this is one of the more popular murals in Valparaiso, but for good reason. 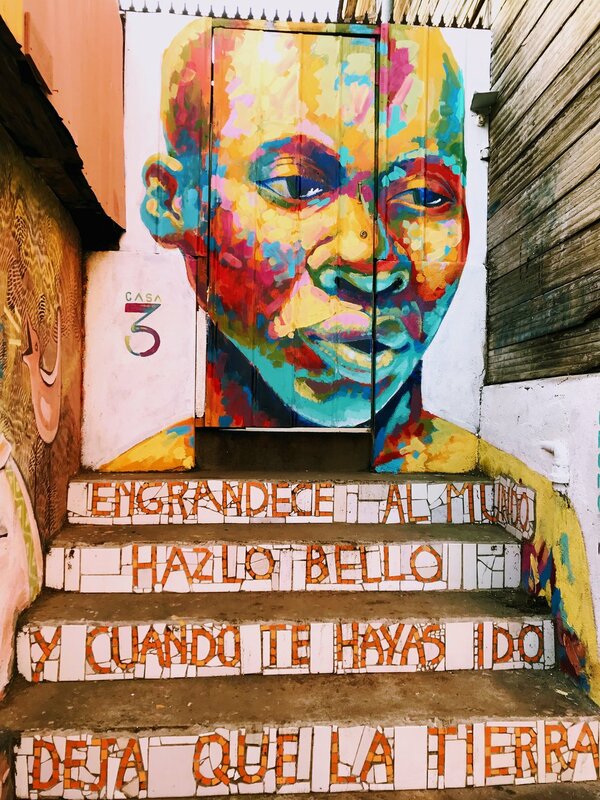 Mr. Papillon spent a year traveling through Latin America, and this mural of a happy, carefree girl is a representation of the places he visited, marked by bold, beautiful colors and a vibrant culture. How can you not be happy when you see this? What little I know about this one is from Eddie - Cromo Maniaco is a pseudonym for a Venezuelan street artist who moved to Chile. His work is notable for its striking colors and deep emotional impact of the subject. And finally, we have my girl Anis. She's one of the few female graffiti artists, and you can see her work throughout the streets of Valparaiso. She has a notable style, using faces of women with bright colors of the sunrise and sunset, such as orange, pink and yellow. This one in particular includes beautiful representations of the phoenix, a symbol of life and rebirth. It's so good! INTERESTED IN VISITING VALPARAISO? DON’T FORGET TO READ THESE POSTS!